At the end of The Passage, the great viral plague had left a small group of survivors clinging to life amidst a world transformed into a nightmare. In the second volume of this epic trilogy, this same group of survivors, led by the mysterious, charismatic Amy, go on the attack, leading an insurrection against the virals: the first offensives of the Second Viral War. This trilogy is so hard to describe because there are so many things I love about it. While the original concept for it isn't necessarily unique, the author's imaginative way in which he created the virals, The Twelve and the characters in it, are. 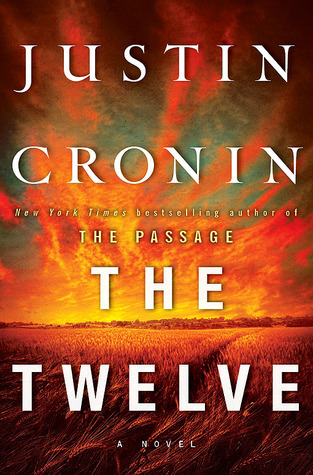 Cronin is a master, hands down, in being able to tell a story riddled with detail, intricate foreshadowing, and the ability to weave a tale back and forth through time that all comes together full circle in a way that only a true writer can. Imaginative, engaging, and completely all its own, this is not your usual tale of vampires, monsters, and an apocalyptic world where humans have to fight to survive. There is so much more to this story. So much that intertwines and connects that at times, it truly is mind blowing. I can't even really say too much other than Cronin is truly a gifted writer and storyteller and if you are looking for something that is like nothing else, then this is the story for you. Something that you have to dissect, and rethink, and re imagine. Something that will keep you on your toes, keep your mind working and thinking and always wondering, then this is the series for you and Cronin is the author for you. I seriously need to read this series. You and Joy are just raving over them! They really are fabulous, long, but fabulous! I would absolutely love for them to make this into a movie! I can't recall ever hearing about this one but a five star read is hard to come by. I have to check this out! This trilogy is just fabulous. I just finished book three and it was awesome! I've heard really good things about this series! It sounds amazing, Ali and I can tell you were really invested in the book! Thanks so much Nick, this one reminds me a bit of The Other series is all the detail and just plain awesomeness. I agree with everything you said Ali, I also review The Passage for LibraryJournal and The Twelve and The City of Mirrors (out this June) for RT Magazine. He's definitely a master. Did you know that the reason he wrote this trilogy is because his daughter wanted him to write a book where a little girl saves the world? Oh my gosh I didn't know that, okay, that is amazing! And now I love it even more. Awesome review, Ali! I love your passion! 5 stars?! Wow! I hadn't even considered this series before but it sounds like I need to change that! I just got the third book and I am now ready to binge read the whole series. I have heard so much about it, and I am actually glad I put it off because I don't have to wait. I am excited. I'm glad I did too Heidi! I just finished the third and it was fabulous!! You have convinced me this is a must read. How am I just hearing about this? Oh wow! It looks like I really need to look for this author's complete work! Nice review. Thanks Melissa, I can't recommend this trilogy enough. I have never heard of this trilogy! Sounds amazing. Great review! Oh no, a book slump! I hope it passes quickly for you. Ideas are not unique, but the way an author WRITES makes it so and it sounds like this is an author that does it very well. Thanks! Hells yeah! I'm glad I reread this with you. I think I appreciated it even more. I'm so glad you did too, I might have been lost without you! YESSSSSSSSSS. I am reading City of Mirrors now and deliberately trying to make it last. It is hard because it whispers read me all dang day! It is a hard one to put down, especially when you get around part four or five. It seems like it just flies after that. This is one series that I will recommend to anyone. Hopefully I will start The City of Mirrors this weekend. Great review! Thank you and you are going to love it!! Between you and Joy I feel like I am really missing out by not starting this series. I think it's already on my Amazon wish list. Great review! Great review! I'm so glad that you loved this one! I liked this one, but not as much as the first book. I don't remember why though. It's been so long that I need to reread both before I get read the third book. Yeah, I'm glad I read them all so close together, there is no way I would have remembered everything otherwise. Oh it's nice to find an author who can write such richly layered stories. Lately I've had a slew of very basic writing. Enjoyble but so...easy. Yes I know exactly what you mean. It's nice to have to think and really contemplate sometimes in books.